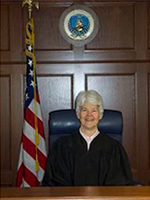 Judge Jill S. Clifton joined OALJ on February 26, 2001. She became an ALJ in 1990, serving 6 years with the U.S. Department of Health and Human Services' Departmental Appeals Board, and before that, 5 years with the Social Security Administration's Office of Hearings and Appeals. Her experience also includes private law practice in western Colorado, serving 9 years as a U.S. Magistrate Judge, primarily in Grand Junction and in Denver, and 4 years as a prosecutor. Judge Clifton received her BA from the University of Florida and JD from the University of Denver College of Law.